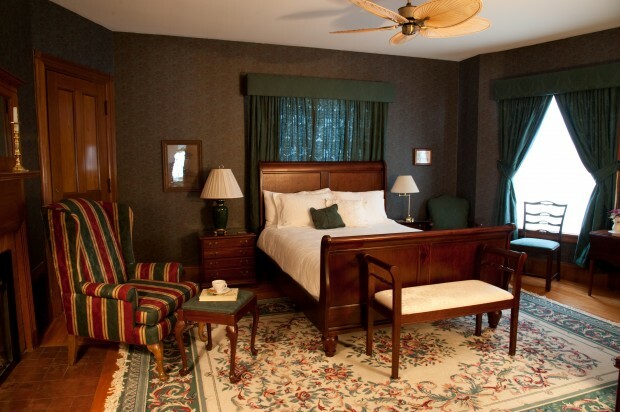 The dark wallpaper and rich woodwork give this room a masculine feel, rightly so as it was the governor’s bedroom. It looks out across the back lawn toward the Green Mountains. It has one queen-sized sleigh bed. 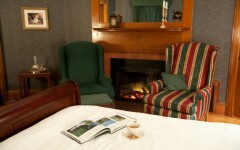 It has an electric insert in the original fireplace, high-speed internet or WiFi, a DVD player, and a CD player/alarm clock. The private bath has the original marble sink and a small built-in chest of drawers as well as a whirlpool tub with a shower. The governor’s bedroom can accommodate a roll-away or crib and can be made to connect to the pink room. Additional guests in the room are $25 each, less for children.